KJShin Functional Health Shoes are the most comfort and light functional footwear. KJShin Functional Health Shoes have been improved and upgraded 9 times since the 1st version was designed in 1990. Now it became one of the best comfort shoes in terms of structural ergonomic design and functional foot health. KJShin are made of top quality airy flexible leather, ATB100 hygienic fiber, patented combo shock absorption pad, embedded magnets and poly urethane with rubber. There are 5 key areas on your foot such as heel, ball, toes, arch and ankle part. The structural ergonomic design with functional characteristics fits them well to alleviate foot muscle stress and deformities. Also you will be free from foot smell or odor due to airy surface materials. KJShin elevates the middle of the foot to minimize muscle pain and fatigue caused by long term walking for people with flat feet. As a result, the bending strength was reduced more than 50% against others. KJShin Functional Health Shoes are also good at absorbing shock with air bags, and the embossing latex combo pad. So it reduces the pressure on the spine and back leading to right posture and a more upright gait. Normal shoes make your feet get tired quickly but KJShin shoes make your feet comfort and free from the structural constraint and pressure. You feel so light and comfort like you are on bare foot. The feet are the furthest away from the heart. If your shoes restrain blood circulation reaching your feet, it will cause a serious health problem. 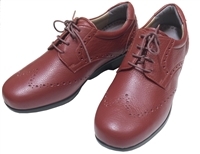 That’s why KJShin Functional Health Shoes are recommended to patients with diabetes, arthritis, back pain, flat feet, obesity, and occupational long time walker or standing people or travelers. Furthermore it’s highly recommended to healthy people for their foot health. KJShin functional Health Shoes are FDA registered as Orthosis, Corrective Shoes. · Keep warm in winter and cool in summer with embedded auto temperature sensor.